Good sales managers will tell their staff that it’s OK to get no for an answer as long as it’s during the initial call or sales visit. This makes perfect sense as no one wants to spend their valuable time when the opportunity for a sale simply doesn’t exist. But in the world of sales, no does not always mean no. Sales people often fail to recognize that when a customer says no, it does not always mean that they are not interested in the product or service you are selling. It may simply mean that they do not see the value in what you are offering. If this is the case you’ve just got more selling to do. But how do you know whether you should continue to sell or move on. Customers always provide signals regarding this and there are three to pay close attention to. First is “indifference”. Here the customer will express that whatever you are selling is just not that important to them. When this occurs you need to use the open probing technique outlined in the professional sales tips #1. Your objective is to ask the type of probing questions that will uncover an unrealized need thereby allowing you to continue the sales process. Signal number two is “skepticism”. The customer has heard the benefits you presented, but they are skeptical that they will realize the same value. They simply don’t believe it. In this case you will want to offer proof, such as a customer testimonial or white paper that supports your position. This is the best way to get the customers to realize there may be some real value in what you are offering. Signal number three is outright “objection”. This is often due to a misunderstanding or a drawback that the customer perceives in your offering. The best way to address this is to make a supporting statement to clear up any misunderstanding. Then remind the customer of the benefits they may have already accepted during the sales process. There are certainly times when you need to carefully review the potential of an opportunity – the effort required to win the deal, the probability of winning the business, and if this is the type of customer that your company will enjoy a long term business relationship with. But before you determine this remember that no does not always mean no. Image “yes? no? 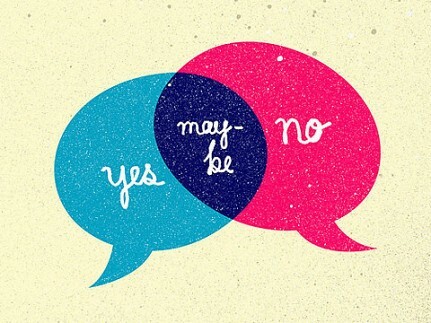 maybe.” by Visionello on Flickr under Creative Commons license.